1. Sensors in Analytical Chemistry. Analytical chemistry at the turn of the XXI century. Analytical information. What is a sensor? Sensors and the analytical process. Types of sensors. General features of (bio)chemical sensors. (Bio)chemical sensors and analytical properties. Commercial availability. Trends in sensor development. 2. Fundamentals of Continuous-Flow (Bio)Chemical Sensors. Definition. Classification. The active microzone. Flow-through cells. Continuous configurations. Regeneration modes. Transient signals. Measurement modes. The role of kinetics. Requirements for proper sensor performance. 3. Flow-Through Sensors Based on Integrated Reaction and Detection. Introduction. Flow-through sensors based on an immobilized catalyst. Flow-through immunosensors. Flow-through sensors based on an immobilized reagent. Flow-through sensors based on an in situ produced reagent. 4. Flow-Through Sensors Based on Integrated Separation and Detection. Introduction. Integrated gas diffusion and detection. Integrated liquid-liquid separation and detection. Integrated retention and detection. Flow-through sensors for multideterminations based on integrated retention and detection. Ion-selective electrodes (ISEs) and ion-sensitive field-effect transistors (ISFETs). 5. Flow-Through Sensors Based on Integrated Reaction, Separation and Detection. Introduction. Integration of gas-diffusion, reaction and detection. Integration of dialysis, reaction and detection. Integration of sorption, reaction and detection. Index. Flow-through sensors are more suitable than classical probe-type sensors for addressing real (non-academic) problems. The external shape and operation of flow-through (bio)chemical sensors are of great practical significance as they facilitate sample transport and conditioning, as well as calibration and sensor preparation, maintenance and regeneration, all of which result in enhanced analytical features and a wider scope of application. This is a systematic presentation of flow-through chemical and biochemical sensors based on the permanent or transient immobilization of any of the ingredients of a (bio)chemical reaction (i.e. the analyte, reagent, catalyst or product) where detection is integrated with the analytical reaction, a separation process (dialysis, gas diffusion, sorption, etc.) or both. The introductory chapter provides an overview of (bio)chemical sensors and their impact on analytical chemistry. 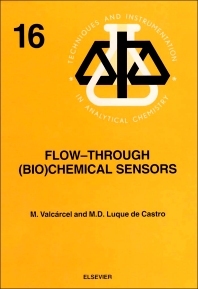 Essential concepts of flow-through (bio)chemical sensors including their definition, classification, the types of flow-cells where the sensing microzone can be accommodated, continuous-flow configurations to which they can be coupled, the measurement modes available and the types of transient signals obtained, among others, are the subject of Chapter 2. The remaining chapters classify the most relevant types of flow-through (bio)chemical sensors according to the processes taking place at the sensing (recognition) microzone, as well as their position in space and time. The book deals critically with most types of flow-through sensors, discussing their possibilities and shortcomings to provide a realistic view of the state-of-the-art in the field. The large numbers of figures, the wealth of literature references and the extensive subject index complement the text.